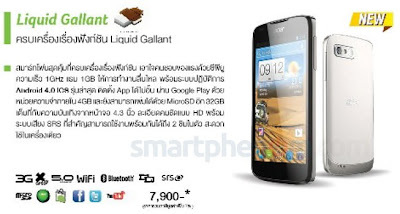 According to the printed Acer4U catalog being distributed in Thailand (August - September 2012), the Acer Liquid Gallant will add Spatial SRS Sound on top of its already impressive (for the price) list of features (click on the image below to enlarge the specification icons). This handset is supposed to fill the gap between the budget Acer Liquid Glow and the premium (and very promising) Acer CloudMobile, making an overall hot summer for Acer in re-entering the smartphone arena. Remarkably, all these 2012 handsets will sport a nearly stock (vanilla) Android experience (which is nice and I hope others will follow) and should be widely available from Acer retailers in a few weeks.